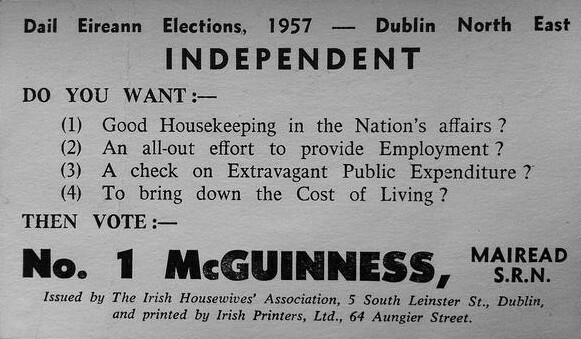 From the 1957 General Election a leaflet from Mairead McGuinness who was running for the Irish Housewives Association in Dublin North East. She polled 1,640 votes. As Mairead de Lappe she had been active in the War of Independence and the civil war , on the Republican side. Her daughter in law is retired Supreme Court justic Catherine McGuinness who was elected to the Seanad in 1979 and served there until 1987. Her son the late Proinsias Mac Aonghusa stood, in 1965 in Louth as the Labour candidate and in 1969 in Dún Laoghaire as an Independent. The Irish Housewives Association fielded 3 candidates at that 1957 Election (there may have been a fourth) , the others being Beatrice Dixon who polled 2,488 in Dublin South West and Kathleen Swanton who polled 669 votes in Dublin North Central. Kathleen Swanton was elected to Dublin Corporation in 1960 as a Housewives candidate. She had previously been elected under the ‘Ratepayers’ banner. There are some details on the The Irish Housewives Association Here which includes a brief summary .. The Irish Housewives Association (IHA) were founded in 1942 to advocate for women’s rights in home and on matters relating to consumerism. In Ireland at the time, there was no other group or organisation making efforts to improving the lives of Irish women in both town and country. The IHA also sought to gain recognition for women’s role in the home and get them more involved in community work and planning. Other issues they would have been active with included women’s access to education, removal of the marriage-bar within the Civil Service, full equality of citizenship, pay, taxation and family planning, burning issues in Ireland up till recent times. The IHA sought to work with the authorities to achieve their aims in contrast to the more radical feminist’s movements such as the Irish Women’s Liberation Movement (formed 1970) whose outlook was strongly left-wing and Republican. Similar aims but different approaches. When the IHA were formed, it had an enthusiastic and mainly middle-class following that crossed the religious divide. However, as the years went by, new membership rates rose too slowly to replace those leaving. Average membership was aging and in the early 1990’s it was decided the IHA would be wound up. The work of the IHA is continued in Ireland by the Consumers Association of Ireland and the Council for the Status of Women.